Organic Bananas – are they worth it? Chiquita bananas – We don’t buy Dole. The organic bananas look the same but that is where the similarities end. Take the peal down and expose the soft luscious banana. You can visibly see and feel the difference. The skin is firmer, even when ripe. The taste is indescribable: it is what a banana should be. You may be thinking that all those chemicals used to grow conventional bananas are no big deal because you peel the fruit. But the chemicals are not just on the outside of the banana – they leach into the soil that is used to grow the produce. So even if you peel your banana, it doesn’t prevent you from ingesting small amounts of those chemicals. Although you may feel better knowing most experts agree that the amount you ingest poses little threat to your health. If you’re concerned about the nutritional value of your food, there are ongoing studies exploring the connection between pesticides and nutrients in foods; so far it looks like organic is healthier. Organic produce is also better for the planet since chemical pesticides make their way into the soil and run off into water sources. Give organic bananas a try. They are simply delicious and your body will thank you. We’ve been sold a bill of goods! 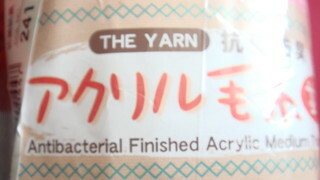 Antibacterial Finished Acrylic Medium Weight Yarn! WHY? The biggest marketing scam about these antibacterial soaps is that “they keep the germs at bay, protecting the individual from sickness.” This marketing lie tries to completely hide the fact that the average human comes into contact with hundreds of thousands of bacteria and viruses daily, and it’s the human immune system that prevents the illness, not the toxic soap. The only thing the soap does is encourage bacteria strains to adapt and grow smarter and stronger, allowing new super-bugs to attack the immune system later on with more force and variability. If you haven’t already started, take a look at the things you buy. What’s in them? These are not just harmless little chemicals. They have lasting repercussions. All those chemicals that you can’t pronounce are causing allergic rashes, they contaminate the drinking water, harm the fish and wreck havoc on the environment. There are alternatives. I’ve started making my own laundry soap. It’s so cheap. There are tons of recipes, so don’t be afraid to experiment. I think I’ll try this one next. This is an awesome shampoo but there are many others. You pay a little more, use a little less, the environment and your health wins. So long as they can make a buck off us, they will keep producing garbage. You deserve the best and your health may depend on it, so demand only the best. You are worth it! As for me? I am getting as dirty as possible. I believe those germs can keep me from getting sick. So, I’m trying to get back to nature. Try something new!